What would it have been like to sit on the veranda of the Silver Pavillion and sip tea from a beautiful Song period celadon tea bowl with Ashigaka Yoshimasa? The full moon bouncing off the white sand cone in the garden and the flicker of candle light glowing off the jewel-like celadon body must have been an intoxicating sight. The fluorescent lightning of modern times is an illumination that leaves nothing to the imagination -- everything is in full sight and the mystery of shadows, as described in Tanizaki Junichiro's In'ei Raisan, is left naked for all to see. How boring! How wonderful is the light of a full moon or the understated hues of candle light! Now I have a confession to make - I don't really care for celadon that much. It's coolness and calculated perfection doesn't connect with my earthy senses that care for Bizen and the likes much more. Yet, when I first saw the works of Seiko Minegishi I imagined myself sitting with Yoshimasa and trading poems about the glory of moonlight and Rihaku while holding a 'clay jewel' in my hand. Minegishi's celadon has a poetic feel that matches my senses. 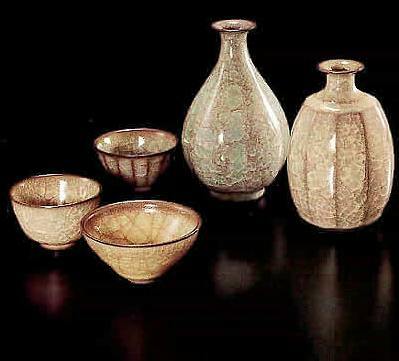 What attracted me to Minegishi's celadon was first of all the form. There was a sharpness and the eye of an artist who paid attention to balance and line. Especially pleasing is his faceted and shinogi forms where the glaze wraps around the cut body or forms concentric circles within the cuts that add a glint of sparkle to the shapes. Minegishi lives in the woods of Nasu, Tochigi prefecture. His celadon quest has seen him taking on hundreds of tests to perfect the glaze. A great surprise awaited me the first time I poured sake into his guinomi- the abstract crackled lines infused with purple tones mellowed and become an emerald pool for the sake to settle in. It was mesmerising. My poetic mind saw many visions- the criss-crossing Los Angeles freeway from a bird's eye view or the intricate entwining flow of arteries in this body that supply a life-line to this bag of bones. 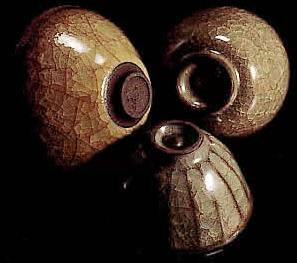 It was a great surprise to me for I thought that only 'tsuchi aji' pieces, like Bizen, changed so drastically with the first pour. Minegishi-sensei has informed me that with fifty or more uses the pieces will change even more. I guess this year sees me drinking from his cups about once every four or five days. No problem there, I do so with great pleasure. The drinking lip on these guinomi greet the mouth like a fine kiss -- sweet and subtle. I can only ask for another touch. The tokkuri have the perfect opening, the size of a pinky, for sake to flow out in the very important and rhythmical tok-tok-tok sound. I never thought I 'd find a celadon tokkuri to be so pleasing to use. The faceted cuts on the one tokkuri make it easy to grip and the tall tsurukubi-uri form of the other tokkuri is a wonderful natural shape in the ceramic world to use.We now find ourselves in the beginnings of a new adventure-the gateway to the 21st century. I hope that humanity will find the strength and wisdom to shine and sparkle like the surface on Minegishi's stunning celadon works.